MATcutter.com has cotton, museum-grade, photo mats precut, in stock or custom cut. 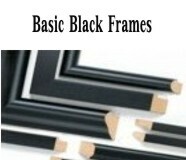 Precut, single mats with rectangle, square or oval openings--the most used, classic matting. Archival 100% cotton, the finest matting material. This archival mat board comes buffered with calcium carbonate. Calcium carbonate resist increased acidity from the environment. Or, unbuffered for those who want 100% natural mats. Cotton mats are one piece (top, bottom and middle) rather than a core with a top and bottom sheet attached. Therefore, when cut, the top, bottom and middle are all the same color. Not just picture mats or photo mats, these precut mats are the best available. Can be used horizontally or vertically. Matboard is approximately .060 of an inch thick. Archival 100% cotton, the finest mats. This archival mat board is available buffered with calcium carbonate to resist increased acidity from the environment or unbuffered, photo rag, for those who want 100% natural cotton mats. Precut cotton mats are one piece (top, bottom and middle) rather than a core with a top and bottom sheet attached. Therefore, when cut, the top, bottom and middle are all the same color. The mat blanks are for craftsman who want to cut their own, artists needing different window sizes in small quantities or for floating photos and fine art right on top of the matting. We have combined our standard windows with an additional window or "Title Block" for identification or tribute. If it is important enough for matting, shouldn't it be surrounded by the best precut mat we have, Archival Cotton mats are used by museums throughout the world. They are designed to preserve the mat contents. Photography, watercolors, prints and originals, look better, longer in Matcutter.com® precut, archival cotton, preservation, matting. Alll mats are made from the finest archival matboard. 4 ply cotton rag, approximately .060 thick. Available in White and Super White. Precut Mats from 8x10 to 16x20 with 2,3,4 even 7 windows in Archival Cotton. Preserve precious images, tell a story or immortalize a moment in 100% Archival Cotton. Whether framing photographs of an event, a newspaper article or a precious momento; archival, preservation, cotton precut mats will help keep them protected for just a few dollars more. This is the finest mat board made. It is 4 ply, approximately .060 thick, and is buffered with calcium carbonate to resist acid from environment and other materials. They are available in white and super white.